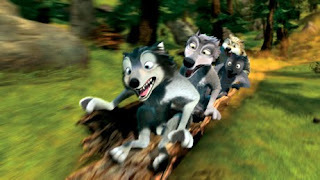 Perhaps in an attempt to jolt you to attention and dazzle you enough to compensate for the overwhelming drop in quality that will follow, near the beginning of Alpha and Omega , the animators fill the screen with high-flying video game action, visually taking you on the same ride the film's main characters embark upon while soaring down a mountain on a log. Designed purely for the sake of theatrical 3D spectacle as the type of obligatory “look at me” sequence to justify the added ticket price for Hollywood's latest format fad, while it's a breathtaking bit of spirited action, the fast cuts and breakneck speed aren't exactly easy on the eyes... even on 2D DVD. 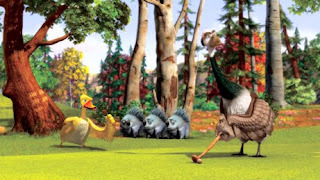 Yet instead of offering us a temporary break from sensory overload, the directors of Alpha and Omega abandon the approach altogether, segueing into a Lion King inspired set-up before eventually recycling subplots, hero's journey roadblocks and plot points from a variety of far superior children's animated movies including Toy Story to Madagascar . With this in mind, it's truly unfortunate that the filmmakers never did use Alpha 's incredibly refreshing decision to opt for a gender reversal to their advantage to further set this Lionsgate animated movie apart from the endless sea of talking animal pictures. 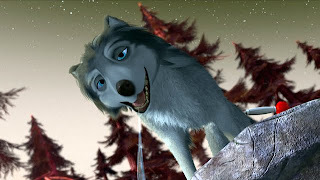 For, while it does originally reflect the intensity of The Lion King , those behind Alpha shift the coming-of-age paradigm from King's male-centric interpretation of Hamlet to focus on a young female wolf instead. Given a rewrite and a much more focused screenplay complete with a girl power twist, which would've been incredibly welcomed by parents of young girls tired of damsel in distress princess fare, Alpha's main character could have ultimately morphed into feistier version of Shakespeare's Juliet instead of being made to jump through pointless formulaic hoops that fail to flow from one into the next. Likewise, I've digressed by taking you several hoops away from the one that comes first. 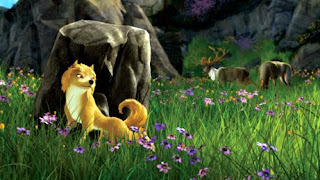 For, having been sent to “alpha school,” to learn how to lead, dominate and put others' needs first, Kate (Hayden Panettiere) is the wolf foreshadowed to become the movie's allegorical “queen” instead of a Lion King. 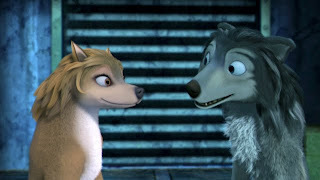 Although as a younger wolf she loved playing with Humphrey (Justin Long), the mischievous, laid-back, peacekeeping omega wolf, their mutual budding attraction is put on the back burner when she's informed by her father (Danny Glover) that in order to unite the woodland creatures, she must wed the son of her pack's rival to prevent the rest of the herd from going hungry. No matter how much of a good team the opposites embodied by alpha Kate and omega Humphrey make, duty comes first and although Kate would ordinarily never dream of jeopardizing it, in a dubious excuse to send the characters on a great, clichéd Homeward Bound: Incredible Journey , Kate and Humphrey are tranquilized and wake up in a different part of North America. Yes, Alpha purports to center on the “message” of being true to oneself, challenging tradition and looking past differences to accept others while coming-of-age. However, we're continually confused by the overall presentation as – midway through the movie – it's as though the filmmakers realized they'd become just as bored as Alpha's intended viewers. 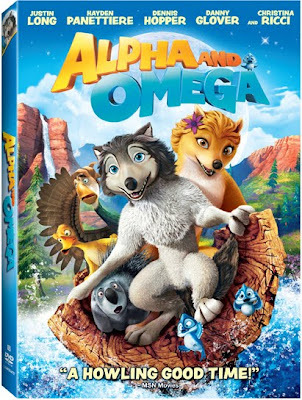 Hoping to remedy the problem by distraction, Alpha temporarily ditches the lesson angle by opting for by-the-numbers predictability as we're quickly introduced to comedic supporting critters that are far more interesting than our alphas and omegas combined. 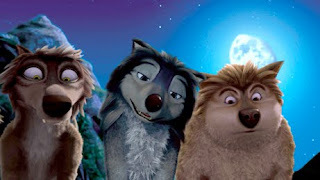 Seemingly forgetting how much potential they had with their female-centric version of The Lion King, Alpha is instead transformed into yet another mediocre animal adventure road trip flick we're sure to forget as soon as the final wolf howls.